Everything in the universe carries a vibrational frequency that can be experienced as sound. Our own cells carry a specific vibration, and our organs give off sound as they work within the body. Many of the ancient healing systems of Traditional Chinese Medicine, Shamanism, and Ayurveda were very aware of the healing impact of sound. As a result, healing rituals containing music and chanting are common in practices like Qigong and Yoga. Ultimately, sound has the power to move and realign our energies, center us, and make us feel good. Frequency is the number of periodic oscillations or waves per unit of time. It is measured in cycles per seconds. The higher tones vibrate more rapidly. If our hearing is perfect we can detect 25-25,000 Hertz. Whales hear up to 50,000 Hertz and elephants can detect sound as low as 15 Hertz. Acupuncture points are mini-vortices. They can be activated with sound. Energy can get stuck, and the vibration of sound can return the body to its natural state. Our meridian system is like a waterway, and water is extremely sensitive to frequency. Sound travels four times faster in water than it does in air and since our bodies are made predominantly of water they are the perfect resonators for sound. The music of the spheres is always around us, but not everyone can hear it. The tone of each planet is created by its velocity as it moves around the sun. The Ohm tone is the sound the earth makes on its journey. The body knows what to do with the tone because of sympathetic resonance (an agreement in the harmony). We speak to each other in social rhythms and tempos. When conversations get out of synch it can lead to boredom, depression, or fatigue. There are a variety of tools and techniques used in music therapy to balance the frequencies within the body; to encourage a deep, peaceful meditative state; and/or to energize and uplift the spirit. Acutonics / Tuning Forks – The sound emitted by a tuning fork is related to the frequency created by its length and resonator disk. Tuning forks are often applied to the various acupuncture points and chakras on the body to encourage energy alignment and optimization. Drums / Drum Circles – drum circles have become powerful tools for uniting people in music, often in celebration of the full moon or during other times of ritual. In addition to the mesmerizing sounds, drumming offers a release of emotions and has proven effective as a stress reliever. It is also helpful for improving attention span and memory. Gongs – Free standing metal gongs are rich with undertones and overtones. They are molded and tuned according to the “Music of the Spheres,” or the sounds of the planets. Therefore, when they are played they resonate with us as a frequency that is familiar. “Musical Rapture” – www.eraofpeace.org/important-information/resources/musical-rapture-mp3/ – a free piece of beautiful, soothing, celestial music from Federic Delarue and the New Age Study of Humanity’s Purpose, Inc. *Editor’s Note: I listen to this amazing music and I feel my spirit lift and my body relax. I have used it with a relative who has Alzheimer’s and it seems to help him feel more at ease. Acutonics – www.acutonics.com – a site explaining the use of tuning forks in balancing the meridians. 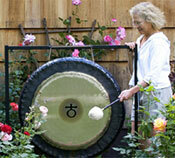 There is also information on sound healing classes, gongs, and tuning forks available for purchase. “Crystal Bowls: Sounding A Note Into The Universe” – www.sacredwaves.com/learn.htm – an article from Sarah Rose explaining how sound, color, the chakras and crystal bowls can unite in healing. Cymatics – www.cymaticsource.com – This site from Jeff Volk explains the unique branch of art/science that studies the phenomena of waves and vibration. “How to Use Sound to Heal Yourself” – http://www.chopra.com/ccl/how-to-use-sound-to-heal-yourself – an overview of how sound healing is utilized in Ayurveda. “Meet the Gongs” – www.scentandsoundworks.com/gongs/gongs_aboutgongs.shtml – details on the different types of gongs and their unique meanings from Maren Good. Music Healing Articles – www.scentandsoundworks.com/library/library_articles.shtml – a collection of articles and poems addressing the power of sound (and aromatherapy) from Maren Good. Music & Sound Healing – Healthy.net – www.healthy.net/Alternative_Therapy/Music_Sound_Healing/97– A variety of articles on sound and music healing. *Note the site sells numerous products, so the information could be biased. Sound & Consciousness Center – www.soundhealingcenter.com – information, training, and sound healing products. *Note it is unclear who runs the site, but the information appears to be accurate. Cymatics – http://cymatica.com/2009/11/17/top-10-cymatics-youtube-videos/ – a visual representation of what sound can create. God’s Cricket Choir – www.youtube.com/watch?v=hGpCtK1KHwI&feature=related – A recording of the beautiful music produced when the chirping of crickets is slowed to reflect the life expectancy of a human. Emei Qigong Grandmaster Wei Zhong Fu, Emei Sacred Healing Sounds (CD), 2003. Pat Bolger, Level 1 Training in Emei Qigong, 10/22/11.